Installation: Loss of Security, Worry Dolls and Smokey Deconstruction, Female Americana, Presented Winter 2019, at Darwin’s Ltd, Mount Auburn Street, Cambridge - by the Cambridge Art Association. CSArt Exhibition at Cambridge Community Television: “Sprouts: Fresh Work from Cambridge Arts’ Community Supported Art Program"—an exhibition at Cambridge Community Television’s Karen Aqua Gallery at 438 Massachusetts Ave. from Sept. 27 to Nov. 7, 2018—is a chance to see what the artists participating in the CSArt program this year have been producing. Get a look into the process of Jessica Caponigro, Emily Cobb, Xian Ho, Peter McCarthy, Susan Murie, Leah Pillsbury and Cory Shea. Join us for a free, public reception at the CCTV exhibit on Oct. 16, from 6 to 8 p.m., plus a tour of the exhibition at 5:30 that evening. CSArt Share, 2018 "Announcing The Artists For Our 2018 Community Supported Art Program. "In March, we picked the new group of artists who will be part of our 2018 Community Supported Art program. Community Supported Art takes the model of buying a farm share to help support local agriculture and adapts it to supporting art-making in our community. Participants make art to sell, while also getting training in the business of art. Consider buying one of our CSArt shares. You get fresh, high-quality art at a reasonable price. Your purchase supports local artists, your neighbors, working right here in Cambridge. Which helps keep Cambridge creative." 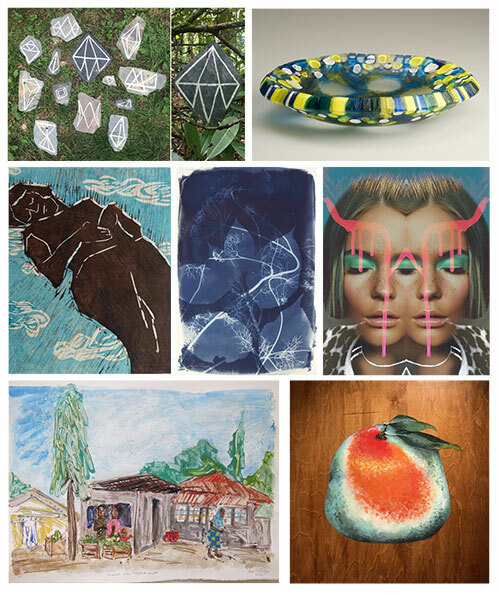 Delicacy - Delicacy is a multidisciplinary exhibition, showcasing the work of five New England mixed media artists. A common thread among the artist’s can be found in their studio practices through the works execution and subject matter. Explored ideas of intimacy and delicately applied techniques resonate in the work. The five artists are Jenny Brown of Providence, Rhode Island, Daniel Zeese of Somerville, Massachusetts, Stephanie Todhunter of Medford, Massachusetts, Cory Munro Shea of Cambridge, Massachusetts, and Susan Emmerson of Dorchester, Massachusetts. In addition to woven expressions of elegance the work simultaneously expresses an undeniable vigor. 'Worry Dolls,' She X 4 | Mia Cross, Noelle Fiori, Lena McCarthy, & Cory Shea at Amazing Things Arts Center, Framingham, MA. November 4th – December 30th 2017 -- Presented new series, 'Worry Dolls" & "Loss of Security" pieces. "Loss of Security" at 13 Forest Gallery, for curated exhibition, "State of the Union" 13 Forest Gallery, Arlington, MA. September 23 - November 11, 2017 "Our exhibition Transition of Power: 2017 responded directly to the surprising events of the 2016 presidential election and the uncertainty many people felt in the wake of its unforeseen results. The work in Transition of Power: 2017highlighted the issues most urgent in the minds of the American public, from immigration and health care to the Electoral College, raising many questions that would hopefully be answered after the inauguration...." More details available here. "3am of the Soul" Featured in Nasty Women at Laconia Art Gallery, South Boston, MA. Nasty Women Boston Art Show is a group art exhibition to demonstrate solidarity among artists who identify with being Nasty Women in the face of threats to roll back women's rights, civil rights, and reproductive rights. The Art Sale is also a fundraiser to support Color of Change and Planned Parenthood. The first-ever Nasty Women Boston Art Show and Sale will be held at Laconia Gallery in Boston's South End SoWA arts district September 1-10, 2017. Solo Exhibition Featuring "Nasty Women" "Step to This" "What You See" "Hallucinating Bombshell" "Suburban Camouflage" "Grace" "Explosion I & Explostion II" & "Loss of Security" Installation, Presented at Christopher's Cambridge, Cambridge, Massachusetts through April 26th. Opening reception, March 23rd, 6-8pm. "Nasty Women" Nasty Women, Knockdown Center, Queens, NY. "Knockdown Center is pleased to announce NASTY WOMEN, a group exhibition that serves to demonstrate solidarity among artists who identify with being a Nasty Woman in the face of recent and ongoing threats to women’s rights. NASTY WOMEN aims to act as a catalyst for conversation, organization, and action preceding the Presidential Inauguration on January 20, 2016. Opening on Thursday, January 12 from 7:00-10:00pm and on view through January 15, 2017, the exhibition invites self-identifying Nasty Women to contribute artwork to be sold for $100 or less, with all proceeds given to Planned Parenthood." "IN PLACE" | A two person exhibition featuring Cory Shea and Mia Cross, presented at Fountain Street Fine Art Gallery, Framingham Massachusetts. November - December 2016. "Graduation," Fay Chandler Emerging Art Exhibition , Scollay Square Gallery, 3rd Floor, September 28 - October 28, 2016 | The 2nd annual Fay Chandler EMERGING Art Exhibition, a celebration of the Boston visual arts community. Hosted by the Mayor's Office of Arts and Culture, the Fay Chandler EMERGING Art Exhibition will feature fresh, original and contemporary works of art created by Boston artists. The art will be displayed at Boston City Hall in the Scollay Square Gallery during the month of September 28 - October 28, 2016. "Graduation" Danforth Art Annual Juried Exhibition, Framingham Massachusetts, June 19 - August 21, 2016 "One hundred forty three works (143) by one hundred thirty five artists (135) at all stages of their careers were selected for the exhibition by Danforth Art Curator and 2016 Juror Jessica Roscio. The exhibition includes some of the best work produced in the region, from both artists who may be familiar to our audiences and those who are new to Danforth Art." "PYT Woman Americana: Salvation Mountain| 30 Under 30, Arsenal Center for the Arts, Watertown Massachusetts, January 8 - February 20, 2015. With Curator Cherie Clinton and Marie Craig, Co-Directors of Fountain Street Fine Art, Framingham, MA. Awarded a 'spotlight' exhibition for the 30 Under 30 Exhibition, for "PYT Woman Americana Salvation Mountain." "PYT Woman Americana: Salvation Mountain| New England Collective V, Galatea Fine Art, Boston, MA, August 1 - 30, 2014, Juried by Edmund Barry Gaither, Director of the National Center of Afro-American Artists and its Museum Division, and Special Consultant to the Museum of Fine Arts, Boston. "PYT Woman Americana: Wild Bill's" | Off the Wall: Community of Artists, Danforth Art, Framingham, MA, June 8 - August 3, 2014. Juried by Danforth Art’s Executive Director Katherine French. "PYT Woman Americana: Salvation Mountain," "PYT Woman Americana: Cassidy Farm," "PYT Woman Americana: Wild Bill's" | Salon 21, Nave Gallery, Somerville, Massachusetts, April 27 - May 12, 2014. With Curator Michelle Fiorenza. "PYT Woman Americana: Death Valley" | Members Exhibition Gallery 263, Cambridge Masschusetts, April 17 - May 17, 2014. "Up" and "Seeing" Coming of Age, New England Artists Under 30, Sharon Arts Center, Petersborough NH, March - April, 2012. With Jurors Cathy Sununu, Director of Portsmouth Museum of Art and Craig Stockwell, Professor at Keene State College. "Harvard, MA" Members Juried II, Concord Art Association, Concord MA, February - March 2012. With Juror Perry A. Price, Assistant Curator of the Exhibitions and Collections, Fuller Craft Museum. "The Great Escape" Northeast Prize Show, Cambridge Art Association, Cambridge MA, May 2011. With juror Theodore Stebbins, Director of the Harvard Art Museums. "The Great Escape" 81st Connecticut Women Juried Art Show, Connecticut Women Artists Inc., Yale University, Spring 2010. With juror Alyssa Monks, Fine Arts Artist. "The Sweet Goodbye" and "Poor Little Artemsisia," 80th Connecticut Women Juried Art Show, Connecticut Women Artists Inc., University of Connecticut, Spring 2009. With Jurors Claudia Seymore and President of CMA Inc, Salmagundi Club. "Almost There" and "Almost There II" Danforth Museum of Art Annual Members Juried Exhibition, Spring 2009, Danforth Museum, Framingham MA,With Jurors Joseph Carroll of Carroll and Sons Gallery and Lisa Tung, Director of Curatorial Programs and Professional Galleries at Massachusetts College of Art and Design. Exploring (Our) Imagination, Soo Rye Art Gallery, Portsmouth New Hampshire, September 22nd - October 18th 2012. "Up", "Seeing", "Wanting MD", "The Great Escape." "Intimacy" Solow Show, ATAC Satelite Gallery, Framingham MA, January 2010.